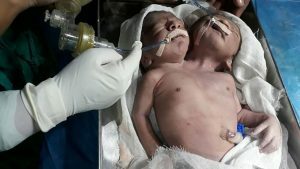 Conjoined twins born with two heads and sharing the same torso known as dicephalic, died less than 24 hours after their birth. According a reports by ‘independent’, the two the boys who were born on October 29 at Swami Ramanand Tirth hospital in Maharashtra, western India. They were placed on a ventilator at birth but doctors said their chances of survival were zero. The two babies weighed just over eight pounds and had separate lungs and hearts, but hared a liver and a pair of limbs. Despite their parents’ fervent appeal to save the life of the conjoined babies, but doctors told them “such kids do not survive”. It would have been impossible to separate them surgically had they survived, doctors said. This reared case of twins born with two heads, but sharing one body occurred in one in a million birth according to report. The physical issue was discovered in the 32nd week of pregnancy when the woman went for an ultrasound . Dr Sanjay Bansode, head of the gynaecology department, said that while the babies were in healthy condition in the womb, they would have no chance of survival post-birth. He said: “The babies were a case of dicephalic parapagus or two-headed twins, which are often stillborn. “It is extremely rare and happens just one in a lakh [equal to one hundred thousand] and chances of dicephalic parapagus twins are of around 10 per cent of such births. The couple already have three daughters and a son. The doctor added: “They were extremely poor and were nervous after the child’s birth.